Previous Post Thought for the week: How do we know if something is real? If chickens laid golden eggs it would of been weird. if they laid golden maybe the chickens would be golden or maybe there is money inside. Birds wouldn’t be able to hatch either. If a chicken laid golden eggs we it would hilarious and mad. We will also be really rich, the world would be a rich place to live. As well everyone would have everything but we will not be able to make or cook couple of stuff/ food. Chickens don’t lay golden eggs because golden eggs are not real . If chickens would lay golden eggs, there would be more crime of stealing chickens and or the eggs. Well if chikens and humans were the only thing on the planet (which they arent so we’re very luky). wouldnt the chikens die because everyone dies dont they? anyway they would die and no one would have anything to eat. People might start stealing the eggs from the farms to become rich! They eggs would be so hard to crack then we wouldn’t be able to eat eggs anymore! Our scrambled eggs would be really sparkly! 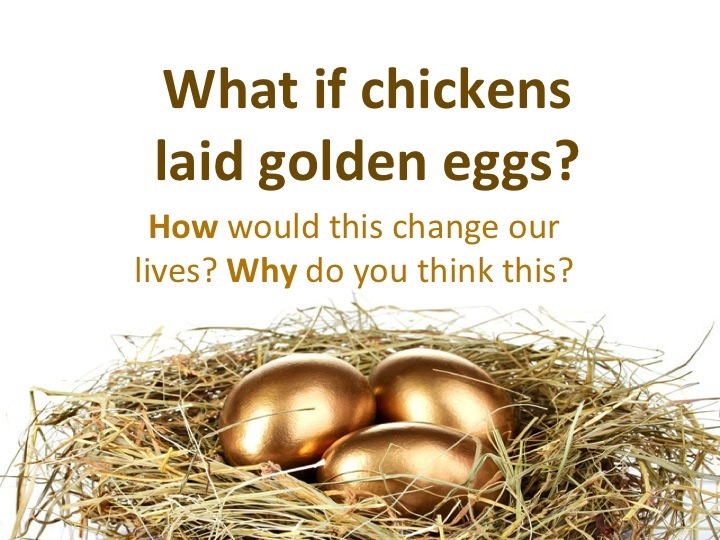 I think if chicken laid golden eggs it would change our lives because people who have chickens they would sell it and get money$$$$$! If they did then people would be very rich because they are gold and cool ! If chickens laid golden eggs,the chick will turn out golden and will be special because the egg is unique. I think if chickens laid eggs it would change our lives, because we could collect all the eggs and sell them then we would have some cash $$$$! If chickens laid golden eggs then chickens would be very useful and none would dare to eat a chicken and if you do you will go to jail and if at least every one will be rich but when a chickens lay an egg they need it to hatch but when a chicken dies every one will be sad but if all the chicken die then there will be no more chickens left then they will have to be Unselfish and make the egg hatch and if the chickens don’t lay any eggs then people will have to use normal money.